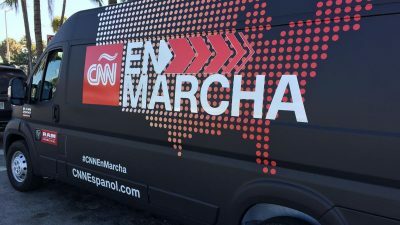 A CNN “exclusive” report from inside Venezuela aired multiple times on the network on January 28. It is a prime example of how influential media outlets in the U.S. effectively create propaganda for the opposition, which now is receiving funds from President Donald Trump’s administration. The segment highlighted hyperinflation at grocery chains, Venezuelans lined up in queues for fuel and food, particularly in Caracas, and opposition demonstrations on January 23, when opposition leader Juan Guaido declared himself president of the country. “This was the day when change was meant to come,” Walsh stated. It suggested President Nicolas Maduro’s government has given “handouts” to Venezuelans for years to buy their loyalty, but now “handouts” are no longer enough. Opponents like to equate social programs to “handouts” because corporate elites favor de-nationalization and privatization of services. Video showed the opposition throwing stones at a military airfield in a standoff that apparently has lasted “for months.” One part of the barricade was on fire. Walsh offered no comment on what it would mean for democracy in Venezuela if the military played an instrumental role in helping Guaido and a U.S.-led group of countries oust Maduro. Another part of the report featured street children in Caracas. A 14 year-old boy recounted how his brother was killed in July by a member of a gang. He said he has to go through the garbage for food and beg so he does not go hungry. On the surface, the report may have seemed balanced and neutral because CNN spoke to citizens caught in the middle of the political crisis. Yet, there was no clips of the tens of thousands of Maduro supporters who marched through Caracas the same day that Guaido claimed he was the country’s interim president. CNN also omitted the role of U.S. sanctions and other measures in making Venezuela’s economic recovery nearly impossible. According to Mark Weisbrot, co-director of the Center for Economic and Policy Research (CEPR), sanctions did not create hyperinflation in the country. However, they have made it incredibly difficult for the government to restructure their debt for a recovery. The same day that CNN aired their report the U.S. Treasury Department sanctioned the country’s state-owned oil company, Petroleos de Venezuela, S.A. (PdVSA). The company is a “primary source of Venezuela’s income and foreign currency,” including U.S. dollars and Euros, according to the Department. National security adviser John Bolton said the sanctions would block $7 billion in assets and result in the loss of $11 billion in proceeds from exports over the next year. Even after the Trump administration announced oil sanctions, CNN still largely ignored the potential effect of sanctions when it aired this “undercover” report another time. Oil sanctions are likely to intensify the suffering for Venezuelans, not make their lives better. In the 1990s, Iraq faced sanctions from the United Nations on their oil exports as well as restrictions on other foreign trade. To many, it was “one of the decade’s great crimes” because the sanctions contributed to the deaths of 500,000 Iraqi children. “The sharp drop has pushed up import costs and stoked inflation, eroding purchasing power and leaving the most impoverished struggling to pay for basic goods such as meat, dairy products, and fruit,” FT noted. None of this history seems to matter to CNN anchors, who subscribe to the Washington bipartisan foreign policy consensus on Venezuela. Nor do they mention that it is not only Maduro’s security forces that commit violence. The opposition was involved in lynchings, burning people alive, and erecting barricades that cause deadly accidents in 2017. Some opposition leaders, including exiles like Lorent Saleh, have ties to neo-fascists. When CNN anchor Jim Sciutto introduced the report, he mentioned Guaido had again urged the people of Venezuela to “hit the streets to demand new elections” in an effort to oust Maduro. It is easy to see how playing the report after this statement might help gin up sympathy for Guaido’s calls to action. But apparently there is reason to believe the opposition may have the support of leaders from several Latin American and Western countries but still be struggling to win over the people. In other words, it is likely that lower classes in Venezuela remain skeptical of the opposition because they fear it will mean inviting outside corporate interests to raid government assets and natural resources so they may enrich themselves. This would potentially lead to cuts or an end to social welfare programs that they utilize to help them survive. This skepticism toward the opposition among Venezuelans is not something CNN wants to feature in its limited coverage of the attempted coup. But it should be viewed as a key reason to doubt the consensus around support for the opposition, which news networks are working to manufacture.